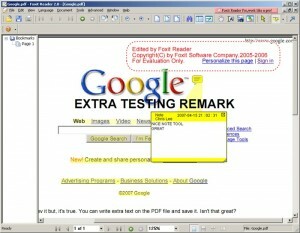 Yes, Foxit PDF reader is a free PDF reader created by other company. Actually I would not recommend if you just want to try a different PDF READER. Foxit is maybe a little faster than Acrobat, but its displayed quality is worse. Also , there are lots of flickering when you resize the window. Then why am I writing about this software? Because it has great advantages over Acrobat Reader. 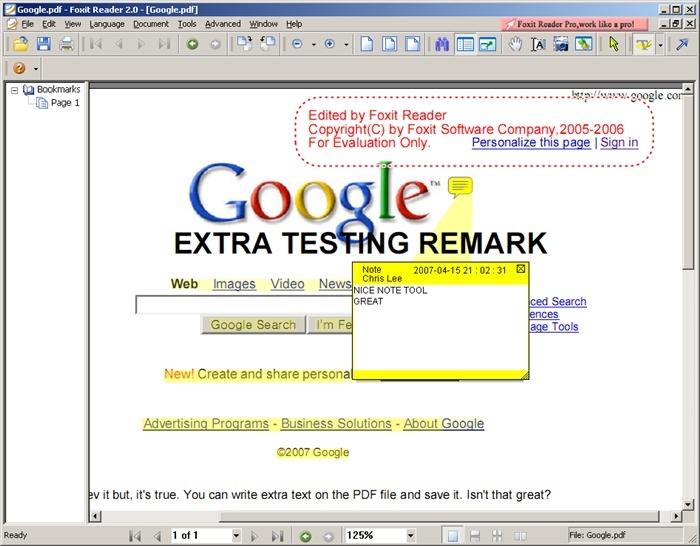 You can write texts , mark Highlight and Underline, and add notes to the PDF file. Some simple graphical diagram tools are also supported. But special watermark texts will also be written at the top right hand corner of the document when it is saved. I heard that many small sized companies use Foxit Reader for this function and because it is free. Are you looking for a free PDF creator/generator? You don’t have to spend high prices to create a decent PDF document. PrimoPDF (http://www.primopdf.com/) is a free to use PDF converter program. When installed, it works like a printer device that you can print documents from any Windows Application such as Microsoft Word and Firefox Web browser. For example, if you would like to create a PDF document for a Yahoo Website, visit Yahoo.com in your favorite Web browser and click on the Print menu. 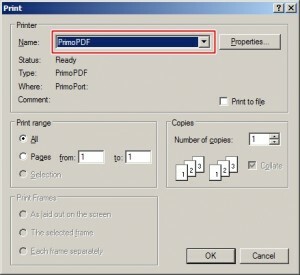 When you see the Print Popup windows , select ‘PrimoPDF’ from the Printer selection list. Then click on the ‘OK’ button to print. Then a new PrimoPDF window shows such as below. Now you can just define the new PDF file name to save as by clicking the “…” browse button. After selecting the filename, you can finish by click on the ‘OK’ button. Here is the captured image of the PDF file opened with Adobe Reader 8. You can click on the image to view the enlarged image. Another great thing about PrimoPDF is that it does not print any kind of Watermark in the generated PDF file unlike some freeware/shareware PDF softwares. So you get the exact document that you want to print. 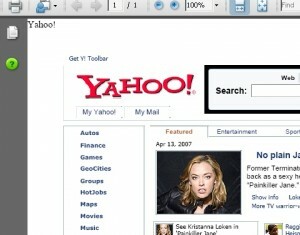 Here is the actual PDF file , Yahoo!.pdf, created with the PrimoPDF. PrimoPDFdownload from CNET Download Site.